What is the charm of the old masters? Why do generations of artists and art historians always concern themselves with the works of Rembrandt, Rubens, Vermeer, Dürer, Caravaggio, and Velasquez to mention just a few? Because these works still have something to say after centuries, because they are mirror images of their time, and are timelessly beautiful because drawing and eraser art is based on a thousand years of basic knowledge, because this knowledge must be learned and perfected to artistry . Artistry can be learned to a certain extent, then it pairs with genius and talent and this defines the master, the great artist. The examination of the old masters is like a central theme of the work of the artist Erhard Schiel. As an eraser and copper engraver, he has held a dialogue with Dürer, deepened in his works to find a new path for himself. The same is true of oil painting, in which Jan Vermeer van Delft has achieved a unique mastery. At the latest since the novel “Girl with a Peral Earring” by Tracy Chevalier has been made into movie even art-uninterested people know the wonderful girl portrait. 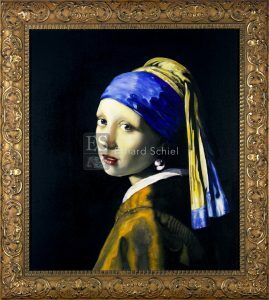 This portrait is mysterious, aks questions and fascinates by the dense color of Vermeer. Every shadow, every nuance, the weight of the texture, the slowness, the stillness in Vermeer’s pictures are magical and perceptible. Schiel has approached the old masters in his own way, paying homage to their beauty and creating something new in the context of our time. What the artist Schiel does with the guidelines, how he approximates, transforms, interprets, and ultimately resolves to create his own – is shown by the new picture cycle.